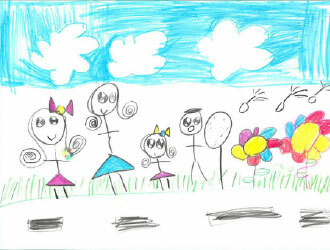 Walk, Bike and Carpool with Bellevue SchoolPool! Sign up for the SchoolPool newsletter by clicking on the emoji! 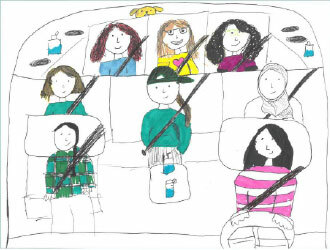 Bellevue SchoolPool is a program that encourages families and students to explore sustainable transportation options for their commute to and from school and alleviate congestion at drop-off and pick-up times and locations. 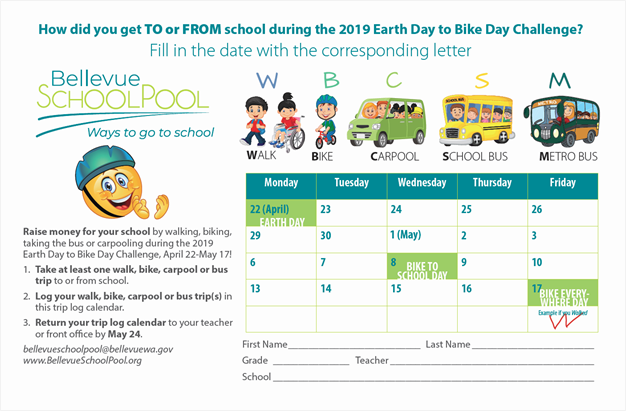 Bellevue SchoolPool focuses on two approximately one-month long SchoolPool challenges during the school year, one in October, the National Bike Month and one from Earth Day, April 22, to Bike Everywhere Day, the third Friday of May. The Bellevue SchoolPool team works with Bellevue School district schools located in Bellevue to provide marketing and educational materials and to engage students in SchoolPool activities during the SchoolPool challenges. Through participation in SchoolPool, schools can also raise money for their school and earn free incentives for their students. For the 2018-2019 school year, Bellevue SchoolPool is split into two programs - one for grades K-5 and a pilot program for teens (6-12). SchoolPool K-5 partner schools' students record their walk, bike, carpool and bus trips to and/or from school in their SchoolPool trip log calendar, which is distributed through their schools. SchoolPool Teen partner schools' students participate in SchoolPool related activities conducted at their schools. Activities may include assemblies, presentations, contests, bike classes, etc. If you would like to become a Bellevue SchoolPool partner school, contact us at BellevueSchoolPool@bellevuewa.gov. Go to our interactive Routes to School map and click on your school to find a printable map of pedestrian and bicycle facilities in your school’s attendance area. The SchoolPool team is currently working with schools to create RideshareOnline.com networks. Stay tuned! We also encourage you to try out Pogo, an easy to use smart phone app which matches you with other parents looking to carpool. 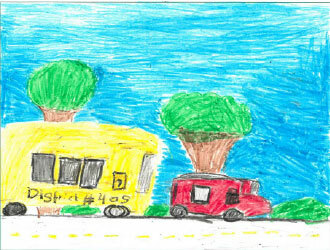 Check out our info sheets on Walking School Bus, Bike Train, and Carpooling. Taking the bus is a great option, too! If you need help or information about King County Metro Transit or Sound Transit buses, contact us at BellevueSchoolPool@bellevuewa.gov. 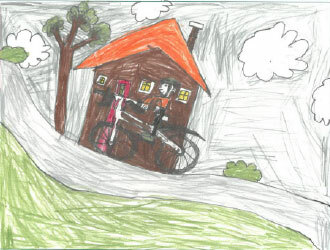 During our 2018 Earth Day to Bike Day SchoolPool challenge, we asked students to use their creativity to share their trips to school with us. Here is a small sample of some of our favorites! Please contact us at BellevueSchoolPool@bellevuewea.gov for any additional questions or comments. Do you know a business that would like to support Bellevue SchoolPool?